SCORM is a flexible standard for storing learning content. Because of this flexibility, Velpic has settings to accomodate for lots of different SCORM content. This article will describe how to choose the best settings for your SCORM content. Skippable (available on all modules). Mark module as completed on Complete/Pass/Fail. For maximum compatibility, the default is Skippable is true and Mark module as Completed on Complete/Pass/Fail is false. If the lesson does not call the complete event then users will need to click the arrow in the bottom right corner of the screen. Skippable means that users can skip past your content by clicking the arrow in the bottom right corner of the screen. This is so that users won't be stuck in the lessons where the SCORM module does not call the complete event. Again, this is is the default. That brings us to option 2. For SCORM modules that do not call the complete event we introduced the option to Mark modules as completed on Complete/Pass/Fail. 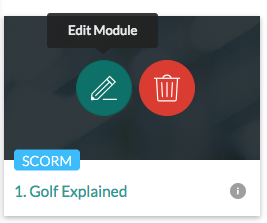 Complete/Pass/Fail is another event that the SCORM module can possibly call. Some SCORM modules call this event when the lesson is first loaded or after the first question, causing the lesson to finish early. That is why it is off by default. Hover over the SCORM module. Select the pencil icon, labelled Edit Module. When you are done, click save. Make sure to preview your lesson before you schedule it to users! This is best practice for non SCORM lessons but essential for SCORM lessons. This isn't an option for everyone but, If you can, try and use Velpic's other modules including Velpic Modules, Video Modules and Document Modules. 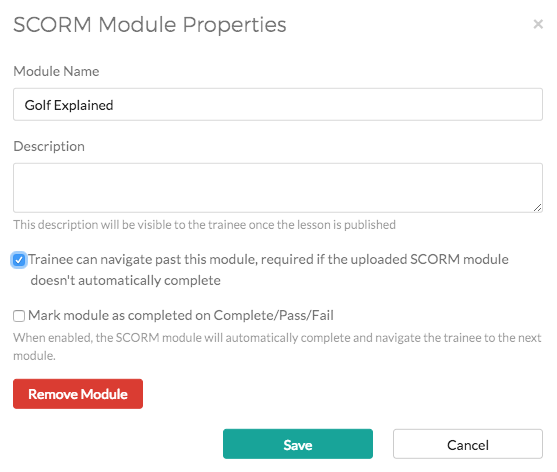 We designed these modules to address some of the problems users have with SCORM modules. We also support a wide range of question formats including feedback on each incorrect answer for example. To prevent users skipping past content, uncheck the Skippable box. The module will be marked as complete when the content calls the complete event. It is important to test the module all the way to the end in case the SCORM content never calls this event causing users to be stuck in the lesson. If the SCORM content does not call the complete event then this option might work. This is for SCORM content that calls the Complete/Pass/Fail event to complete the lesson. It is important to test the module all the way to the end in case the SCORM content calls this event before the end of the lesson, causing the lesson to finish early. This mode offers the most compatibility which is why it is the default. Users can skip past the content using the arrow in the bottom right corner of the screen. Velpic will still complete the module if it receives the complete event. If the content doesn't call the complete event, then users will need to use the arrow in the bottom right corner of the screen to complete the lesson. This sounds easy but can be quite confusing because some SCORM content will say the lesson is complete but we still need the user to tell Velpic the lesson is complete because the content failed to do so. The lesson said I had completed it but my lesson is still due. This can happen with recommendation 4. (the default). If the content does not call the complete event. You will need to hit the arrow in the bottom right corner of the screen. Users can skip past the content. This can happen with recommendation 4. (the default). If skippable is enabled then users can skip past the content. Try recommendation 1. or 2.